You will receive 1 x 15-card booster pack. 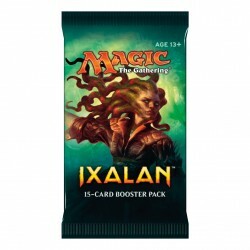 Booster packs are solely for deck building, expansion & collection purposes. You will not be able to play the game without a deck (not included). Image on product may not match the pack you receive, as it is randomly supplied. The darkness of Innistrad is getting deeper, as monsters and townsfolk warp into terrifying new forms. Even the plane's sworn protector Avacyn now inspires dread. You must defeat strange new horrors to uncover the source of this growing lunacy.